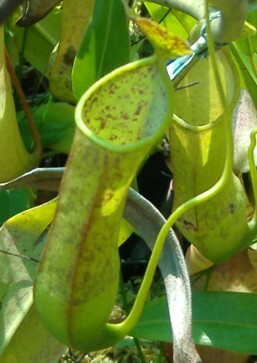 Nepenthes tobaica is a scrambling vine that is somewhat similar to N. tentaculata and N. gracilis. 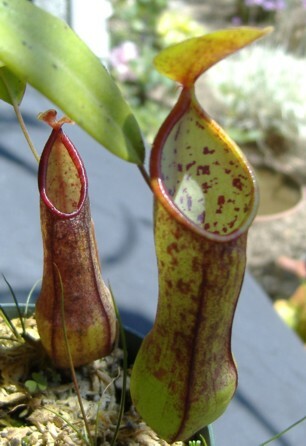 Malesiana Tropicals indicates that pitchers can be pure green up to and including a rare all red and nearly black variety. The most common form is the one pictured at the top of the page. My all red form just produced its first pitcher that is red. I grow this clone with my other tobaicas under shade cloth outdoors with no problems so far. I got it from a private grower so I don't know the plant's origin. The purple clone starts out very similar to the regular N. tobaica but darkens up with age. I got this clone as a rooted cutting from a private grower too. I did have a cutting of Exotica Plants' purple clone but it died. This species loves to climb and wrap its tendrils around anything for support. 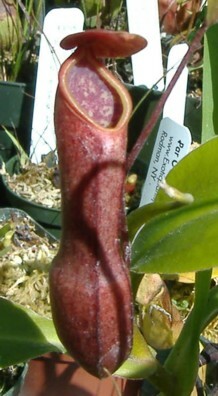 It stays relatively small and can be grown in smaller spaces than other Nepenthes. Since it grows fairly rapidly, many offerings are from rooted cuttings that are priced very reasonably. This species could make a nice indoor specimen although I've never tried growing it that way.